Orders that exceed listed availability will automatically be voided without notice. 400 MHz (ARM11 32-bit RISC processor). 512MB (256MB Flash, 256MB SDRAM), Flash is field upgradable via USB or SD memory devices. 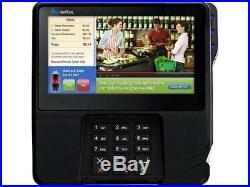 Embedded Linux with Verifone security enhancements. 7 WVGA (800 x 480) Capacitive touch screen Corning Gorilla Glass technology. Full stereo standard on unit. Power pack output requirements: 12W, 12 - 24 V DC Power pack input requirements: 100 - 240 V AC, 50/60 Hz. 2.20" x 8.60" x 9.10. Large, 7 color screen area efficiently accommodates optional signature capture along with scrolling account activity, branding and promotional offers NFC/contactless enabled to support electronic wallets Generous touch screen and pen-like stylus for easy signature capture Ideal platform for a variety of value-added services, such as administering loyalty schemes, gift card issuance and top-up services Linux-based OS and application development environment offer powerful and simple development options. This listing is currently undergoing maintenance, we apologise for any inconvenience caused. 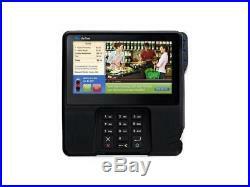 The item "VERIFONE M177-509-01-R MX925 Multimedia Transaction Terminal" is in sale since Wednesday, December 21, 2016. This item is in the category "Business & Industrial\Retail & Services\Point of Sale & Money Handling\Credit Card Terminals, Readers". The seller is "newegg" and is located in United States.